The bulk of this painting is looking nearish completion now, just the rider's left foot to paint really, and the section above the browband, and the plaits, the bridlework still needs some work too... hmmm maybe quite a bit left then. Unfinished bits aside there are still many hours worth of tidying up to do pretty much everywhere! 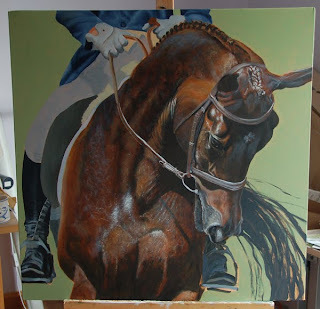 Such a big painting and so much to focus right down in on. 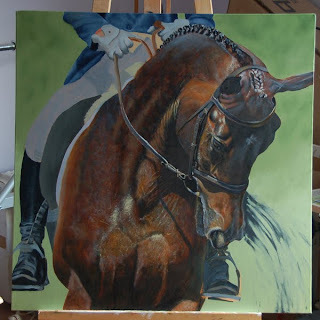 I am almost always guilty of getting to the finished-but-slightly-untidy stage and rushing to declare it done before regretting it later so I think I am going to get it finished to a reasonable standard, re-touch varnish it and then add the finishing tidy-up bits with fresh eyes after a few months when they start to really bother me. I am really pushed at the moment trying to complete commissions so the only time I get to work on this is when things aren't going to plan on the commissions and I need a short break to re-focus! Really enjoying my current commissioned work, lucky to have such wonderful clients with such beautiful and interesting horses! 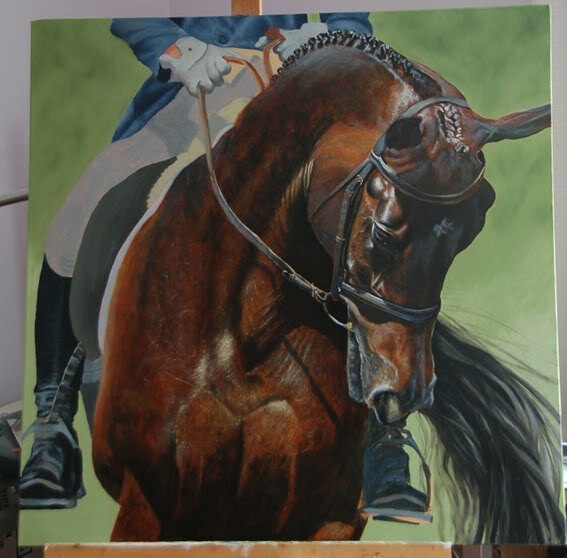 Been away for the weekend and am snowed under with commissioned work so not much done on this, the tail went on today though! Still struggling for a title for this! More rough detail on the plaits and another layer on the background. 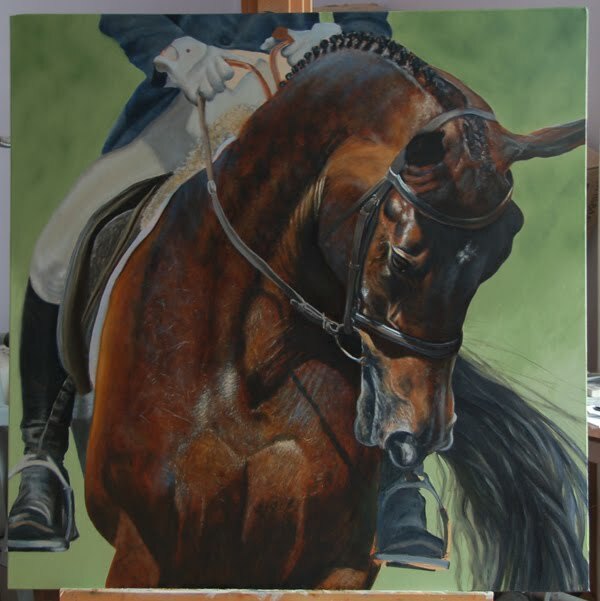 I think I will probably keep the background simple and leave it as it is, but will decide once the horse and rider is finished! First layer of detail has gone on the bridle now, just highlights really. Some highlights on the forelock plait too.